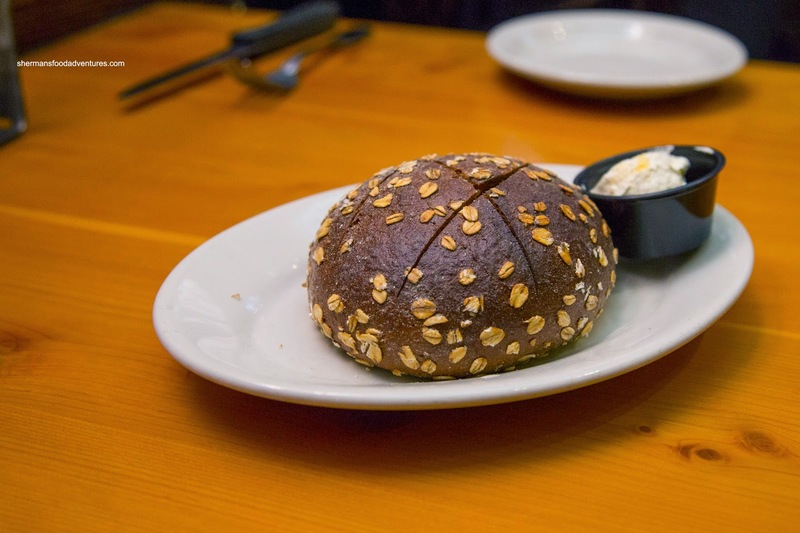 Normally, I don't really talk about restaurant bread unless it is something that is more unique than white bread. Yes, this was the case here as we were served a Molasses Loaf that somewhat resembled the honey-oat at Subway. We weren't planning on eating it much, but ended up dusting 2 of them off. Was it because we were hungry after wading through the crowds at Target or was it really that good? Honestly, we weren't really sure... Since the portions at the table next to us looked rather large, we decided to share 2 entrees. Each came with 2 sides and I was excited to try the Wedge Salad. When it arrived, it looked like a plain ol' green salad. 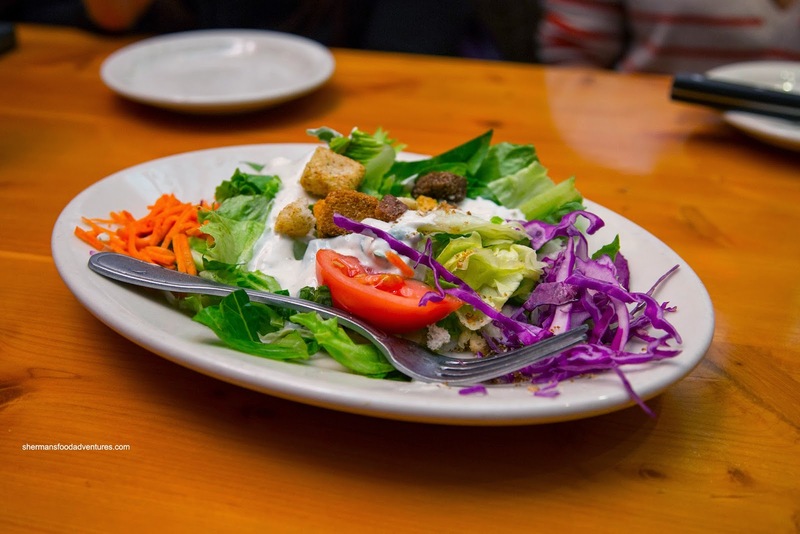 At first, we though they made a mistake, but after a taste, it indeed has the blue cheese dressing (that was supposed to come with wedge salad). Our question was: why call it a wedge salad when we didn't get a wedge of iceberg lettuce??? 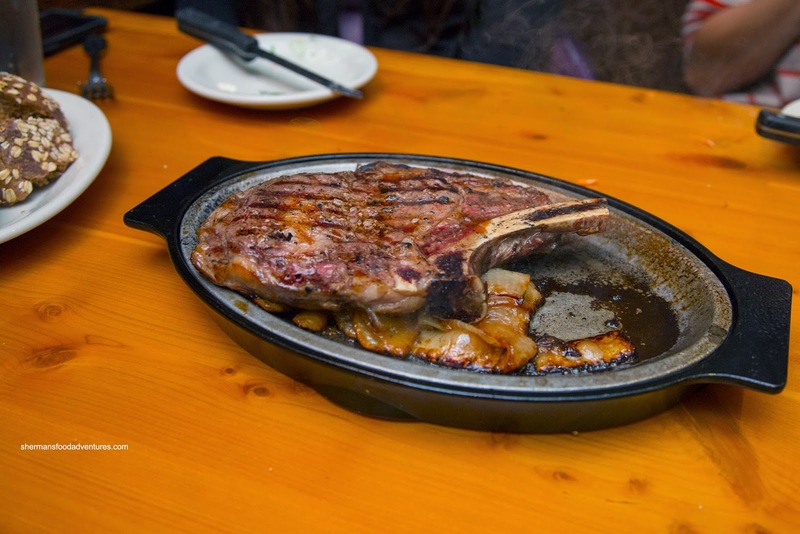 Okay, onto the mains, the sizzling cast iron pan of our Rib-Eye arrived first. It was served on a bed of caramelized onions which were the beneficiary of the super hot pan. Hence, they were sweet and yes, caramelized. However, the steak itself was super-bland. We understand that there is no need to over-seasoned a good cut of beef, but usually, rib-eye should be flavorful to stand up on its own. It didn't do that in this case. On the other hand, it was relatively tender (for that cut of meat). It was served with onion rings (with the other side being the salad. We enjoyed the crunchy onion rings but really, there wasn't much of it. Those pictures on the menu are deceiving! 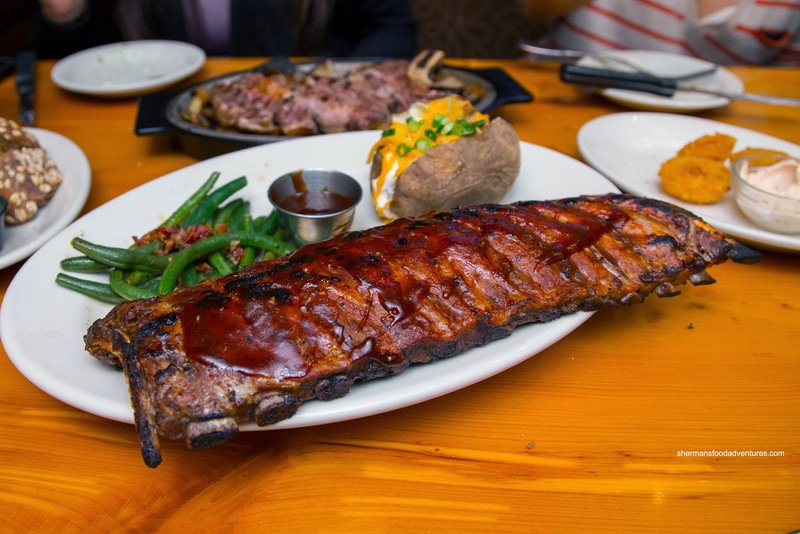 Lastly, we shared the Full Rack of Ribs with a loaded potato and green beans. For par-boiled ribs, these weren't bad as they still retained a meatiness (without being wet nor dry). There was a decent amount of charring which added a smokiness. Personally, I thought the BBQ sauce could've been smokier as it was rather sweet. I wasn't a huge fan of the potato though as it was rather dry. Also, it didn't live up to being loaded as there could've been more topping (which would've made up for the dryness too).Although a bit greasy, the beans were still crunchy and vibrantly green (with the goodness of bacon!). 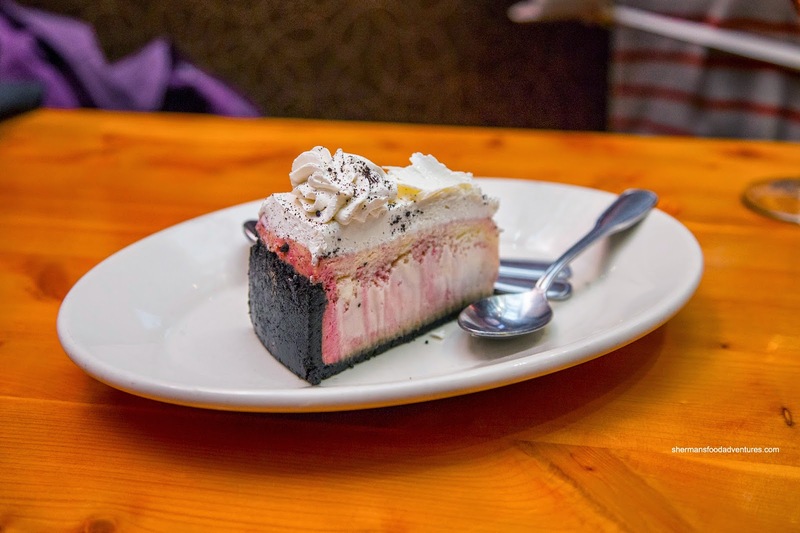 For dessert, we had the White Chocolate Strawberry Cheesecake since I was out-voted (I wanted to just leave...). Well, I guess I was wrong a the cheesecake was solid with a creaminess that was not overly sweet. It wasn't too firm, not too soft which is exactly how like it. With the items we did try, we felt that somehow the meal was lacking even though nothing was particularly amiss. 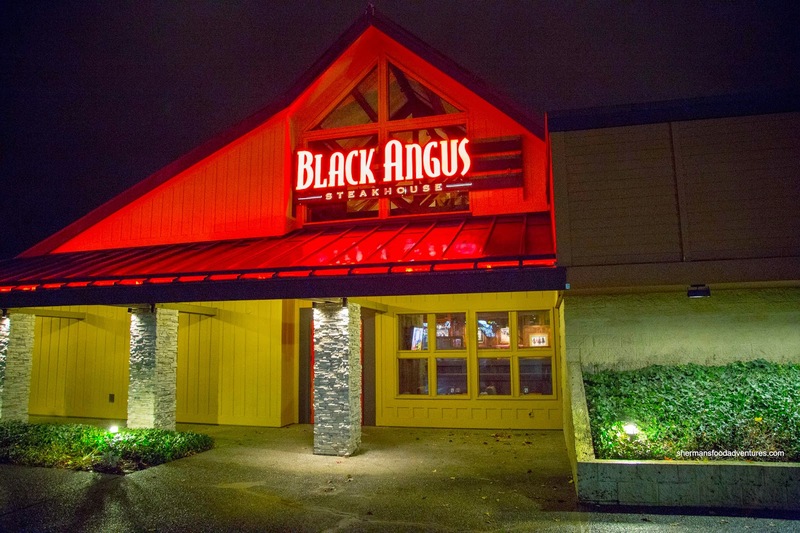 I guess being a chain restaurant, Black Angus did what it was supposed to do, especially on a holiday. Not something I'm aching to return to, but whatever, we got fed when most other places were closed.